UPDATE!!! New Version of Swine Project Award Application! Support local farmers! 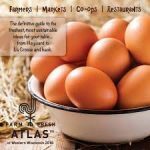 The Western Wisconsin Farm Fresh Atlas is your source for finding homegrown foods, including vegetables, fruits, meats, eggs and more. Pick up your hard copy at the UW-Extension office or download online at http://www.wwffa.net/. The University of Wisconsin-Extension provides Title IX requirements, which include affirmative action and equal opportunity in education, programming and employment for all qualified persons regardless of race, color, gender, creed, disability, religion, national origin, ancestry, age, sexual orientation, pregnancy, marital or parental status, arrest or conviction record or veteran status. Requests for reasonable accommodations for disabilities or limitations should be made prior to the date of the program or activity for which it is needed. Please do so as early as possible prior to the program or activity so that proper arrangements can be made. Requests are confidential (ADA requirements).